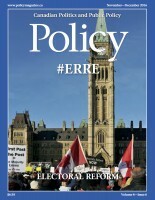 Last week, the Centre for e-Democracy (CeD) released key findings from the SSHRC-funded Internet Voting Project; a study of voters, candidates, and election administration during the 2014 Ontario municipal elections, in a webinar presented by Nicole Goodman, CeD Research Director and Assistant Professor at the Munk School of Global Affairs. In her presentation, which you can view below, Nicole discusses the benefits and challenges of using Internet voting in municipal elections from the perspectives of voters, candidates, and election administration, and how the inclusion of this technology is changing elections. The webinar, hosted CeD Founder & Chair Adam Froman, also provides some context regarding where Canada sits internationally with respect to electoral modernization.